Eatsmart Snacks® Veggie Sticks are made with tomato, potato and spinach, prepared in 100% expeller pressed sunflower oil, and seasoned with sea salt. This smart snack with 63 Sticks per serving and a satisfying crunch will leave you with feelings of “more good and less guilt”! Our Veggie Sticks contain 40% less fat than the leading brand of regular potato chips*. 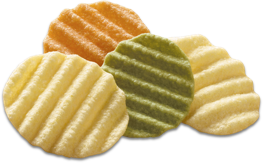 *the fat content has been reduced from 10 grams per 29g serving for regular potato chips to 6 grams per 30g serving. Potato flour, expeller pressed sunflower oil, potato starch, corn starch, rice flour, tomato paste, salt, potassium chloride, spinach powder, sea salt, turmeric. Our products are now processed in a Peanut Free facility. Eatsmart Snacks® Veggie Crisps are made with tomato, potato and spinach, prepared in 100% expeller pressed sunflower oil, and seasoned with sea salt. Perfect to pair with your favorite dip or enjoy right out of the bag. Certified Gluten Free and non GMO Project Verified. Our Veggie Crisps contain 40% less fat than the leading brand of regular potato chips*. Potato Flour, Potato Starch, Expeller Pressed Sunflower Oil, Salt, Tomato Paste, Sea Salt, Spinach Powder, Potassium Chloride, Turmeric, Beet Powder. 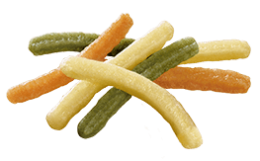 Eatsmart Snacks® Organic Veggie Straws are made with tomato, potato and spinach, then seasoned with Himalayan Pink Salt. This smart snack will satisfy a crunch craving and is made with ingredients that are certified organic. Organic Potato Starch, Organic Corn Flour, Organic Sunflower Oil, Organic Rice Flour, Salt, Organic Spinach Powder, Organic Tomato Powder, Organic Paprika, Organic Red Beet, Organic Turmeric.